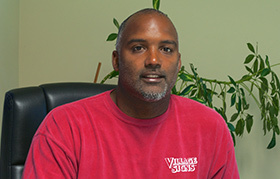 About Us « Village Signs Inc.
Tony brings 20+ years of customer service experience to Village Signs. His focus and commitment to high quality standards and customer satisfaction are his top priority. Tony received his Bachelors degree in Business management from Bridgewater State University and Masters degree in Human Resource Management from Northeastern University.He is a member of the New Bedford Chamber of Commerce and the United States Sign Council. 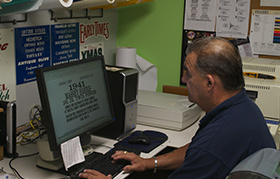 Ken has been in the sign industry for 33 years, 30 of them as owner of Village Signs. Ken is a graduate of Butera art academy and currently works part-time in our design dept. 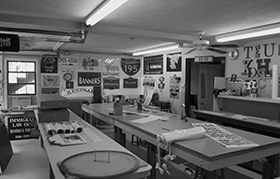 Lance attended Bristol Community College focusing his studies on education and graphic design.He began his design career at a local shop working with vinyl and automobiles. For many years he has designed print and web material for the Burgo Basketball Association, that runs a basketball league for kids, ages 6 and up, where Lance sits on the Board of Directors. Established in 1981, Village Signs started as a small sign shop in the Mattapoisett garage of Kenny Pacheco. 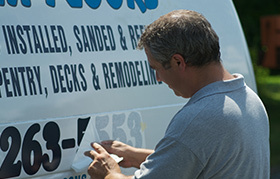 As a one man operation, Ken specialized in hand painted signs, boat transoms and truck lettering. Over the next several years, the business steadily grew and prospered. This growth necessitated a move to the current Mattapoisett location allowing Ken to better meet the needs of his customers. ln 2010, Village Signs came under new ownership with Tony Tranfaglia ready to continue the tradition of quality, craftsmanship and personalized service. With Ken still on board to share his knowledge and experience and Tony bringing in new vision and skills Village Signs expanded their customer base yet again. Lance Burgo joined the team in 2011 as a proﬁcient design expert. Today, the collaboration and efforts of Tony, Ken and Lance work successfully to meet all of your signage needs in a personalized and friendly manner.